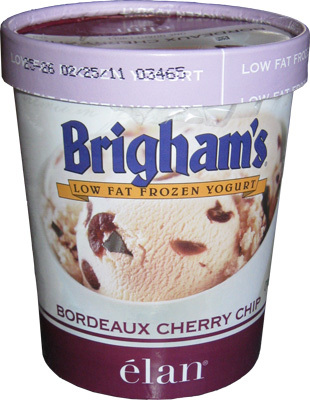 Back in 1994, Brigham's relaunched elan frozen yogurts after acquiring local company elan in 1993 and tweaking the product line. 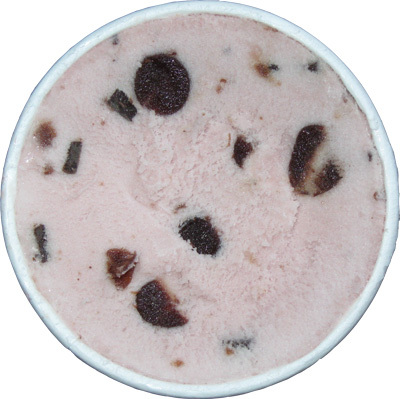 This particular entry is Bordeaux Cherry Chip which is cherry low fat frozen yogurt with cherries and chocolate chunks. Now you know a product is going to knock your socks off when they can't even be bothered with listing the various flavors on their website. I'm sorry, but that's unforgivable. Ok, here's the close up and at first glance you are probably thinking "oh, I love cherries, this flavor must rock!" Now look closer... closer... closer... you probably can't see it can you? This junk is like eating frozen milk... or maybe someone literally just took yogurt and threw it in the freezer. A frozen dessert like this should NOT crunch! It was just disturbing. To be honest, I'm not even really sure I see elan offered very much. This particular pint is from Market Basket and I'm pretty much deathly afraid to try any of their other flavors at this point (if I could even find one). It's just not worth it. I tried to do my duty and I took several bites before throwing this junk out. The base seemed very mild (and crunchy), the chocolate chips were fine (and crunchy, hehehehehe), and the cherries, well, I just ate around them for the most part. They were not crunchy thankfully. If Brigham's wants to hook us up with some fresh samples I'll try it again, but until them, I'm very afraid and I have better things to do with the 4 or 5 bucks I blew on this stuff. Yuck yuck (CRUNCH) yuck.